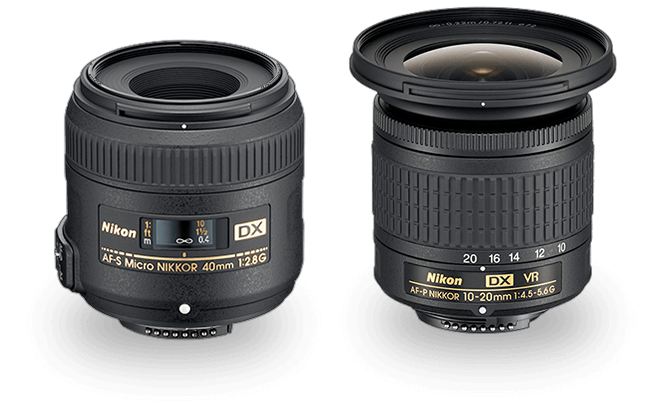 If youre the proud owner of a Nikon DSLR camera kit, you already have a great everyday lens. Are you ready to get even more out of your photography? The new Landscape & Macro 2 Lens Kit is the perfect complement to your current gear. It includes an ultra-wide-angle zoom lens thats great for landscapes and a fast macro lens that lets you get lost in the smallest details of life. Expand your creative horizons and discover exciting new images all around you. D500, D7500, D5600, D5500, D5300, D3400, D3300 and later models. D5, D850, Df, D750, D7200, D7100, D5200, Nikon 1 series with the FT1. D4 series, D3 series, D2 series, D1 series, D800 series, D700, D610, D600, D300 series, D200, D100, D7000, D5100, D5000, D90, D80, D70 series, D3200, D3100, D3000, D60, D50, D40 series, film cameras.